In the modern world we all sometimes have a poor diet, particularly if stressed. Stress also reduces magnesium levels. 50% of magnesium is stored in bone; 50% intercellular; and only 0.3% of total body magnesium is present in the serum. Muscle cramps, especially the calves. Muscle twitching, often around the face. Memory problems and poor concentration. Fatigue and Chronic Fatigue Syndrome. Rosemary, Turmeric, Sage, Rhodiola, Red bush tea. The list is endless. However, a supplement can be taken such as Magnesium Malate or Citrate. One of the best ways to increase magnesium levels if they are low is to use Epsom salts in a bath, 3-4 large handfuls in a warm bath, soak and enjoy for 15 minutes 2/3 times a week. 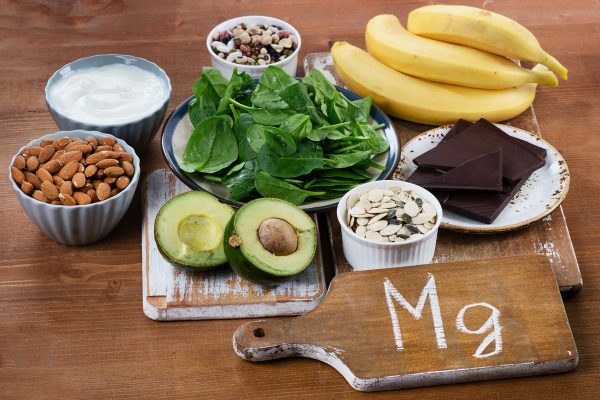 Another effective way to absorb magnesium is to use a magnesium spray, as an oil or a body lotion. Serum measurement of magnesium is not helpful, the only accurate measurement is Red blood cell magnesium (2.4-2.57mmol/L) is the normal range. Always consult a health practitioner before assuming you have a low magnesium level. For more information on nutrition, see Nutrition and Gut Health. If you would like further advice or have concerns, then book an online skype consultation with Dr John Moran.